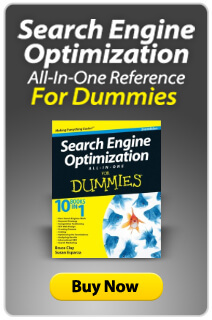 With a name like search engine optimization, it can be easy to forget the user at the center of it all. But listen to any talk by Google ambassador to the SEO community, Matt Cutts, and it's clear that search serves the user, and so must SEO. In this article, three experts weigh in on balancing SEO and UX requirements. SEO works to funnel qualified visitors from a search down a conversion funnel on a site; likewise a UX practitioner is working to ensure that the user enjoys a frictionless visit, aiding the likelihood of conversions. What makes a blog post readable? Well, there’s an answer, but it’s not a simple one. Consider this though: What makes a painting pleasing to the eye? It’s the aesthetics, right? When looking at a painting, it may not be easy to explain exactly how the artist came to the end product, but there is a method to the madness – an experience the painter creates for the person through style and technique. And a blog post is no different. In the complex social landscape, Google doesn't want to be left behind, especially now that large brands are actively engaged on Google+ and almost 200 million users have signed up to the platform. In order to gain momentum and have users — and brands — invest in Google+, Google needs to further improve its product, and provide functionalities and solutions that the competitors cannot meet. While Google has been cracking down on bad linking practices over the past few months, things have been fairly quiet recently — until yesterday. Another wave of notices from Google Webmaster Tools hit inboxes in the past 24 hours, and we've seen businesses across the U.S., Europe and South America notified of "techniques outside of Google's Webmaster Guidelines," with specific instruction to review "artificial or unnatural links." Bruce Clay, Inc. has been working with clients and the Web marketing community to provide information on how to prune bad links affecting the health of websites. Our SEO Penalty Assessment helps clients who are seeing these types of notices from Google, especially after the Penguin algorithm update hit earlier this year, and elevated Google efforts towards eliminating spammy linking practices. "If you received a message yesterday about unnatural links to your site, don’t panic. In the past, these messages were sent when we took action on a site as a whole. Yesterday, we took another step towards more transparency and began sending messages when we distrust some individual links to a site. While it’s possible for this to indicate potential spammy activity by the site, it can also have innocent reasons. For example, we may take this kind of targeted action to distrust hacked links pointing to an innocent site. The innocent site will get the message as we move towards more transparency, but it’s not necessarily something that you automatically need to worry about. Discouraged by the difficulty of measuring results, or burned by an unethical practitioner, site owners often view SEO with snake-oil skepticism. This is what's behind looming hesitance to invest in SEO. Recent reports suggest a segment of small businesses are shying away from SEO. Much of the problem has to do with a knowledge gap. When businesses are passing on SEO and instead reporting willingness to invest in paid search, social media and content, you have to wonder if there's a misunderstanding of what SEO is. Content is a critical component of SEO. Social media's value to SEO includes links, brand ownership for SERP real estate, and contributing to social signals in search rankings and results display. Paid search and organic search optimization amplify one another. As SEO practitioners, we hold some responsibility for informing the business community of the role of SEO in marketing efforts. Search pages are a highly competitive field and yet, they can't be overlooked for traffic and lead generation. Rather than avoiding SEO out of fear or lacking knowledge, SEO education establishes the marketing medium as another useful tool in the marketing arsenal. While organic search is sometimes considered the "free" space, uncertainty over the mounting cost of organic search optimization may also keep some small businesses from investing in SEO. As with all things, it helps to know where the investment is going in SEO and how the investment is returned. Read Bruce Clay's explanation of SEO pricing and what to expect from an SEO service provider for the cost. And consider SEO training to ensure you understand SEO, in order to manage your service provider and your site's performance in search. For a complete list of locations and dates for upcoming SEO training, see the Shindigs section below. In a wave of recent layoffs, Microsoft downsizes its staff including long-time employee Mel Carson, a digital evangelist for the company. In one of the most-talked about shuffles of 2012, former Googler and 20th employee of the company Marissa Mayer joins Yahoo! as its chief executive officer. Internet darling Digg says “goodbye” as startup Betaworks buys the company, reportedly folding it into its News.me product. If you haven't latched on to the new version of Google Analytics yet, now's the time as Google announces the retirement of the old version as of July 17. Between now and October, cities around the world will be holding Usability Week events. Upcoming seminars, tutorials and networking events centered on tools and practical applications to improve site usability will be held in Toronto, Sydney, San Francisco, London and New York. SES San Francisco takes place August 13 to 16 with an SEO training workshop with Bruce Clay on August 17. Use code 20BRU when registering for a 20 percent discount on your conference pass. The newly updated SEOToolSet® standard and advanced training and certification course will take place in Simi Valley, Calif., from September 10 to 14. Signal: Chicago is set to cover "Mapping Marketing's Data Flows: Social Content, Analytics, and the Power of Location" on September 11. DemandCon Boston will stride into The Walking City October 1 and 2. Ft. Lauderdale, Fla., hosts the two-day CRO-focused Conversion Conference October 9 and 10. DMA2012 direct marketing conference will take place in Las Vegas from October 13 to 18. Bruce Clay will co-present on Using Content Curation to Drive Marketing and Revenue. SMX Melbourne will be held on September 5 and 6, 2012. Social game-maker Zynga announces lending staff developers to create a social game for charity on Facebook aimed at helping end oppression of women and girls worldwide. Cheers to Bing for being an SEO-friendly search engine with the Phoenix Update to its Webmaster Tools and the link disavow protocol, helping site owners rid their Web properties of unwanted links. Microsoft joins forces with the UK Youth charity to open 30 Microsoft Youth Hubs, providing clubs for disadvantaged children to learn about IT. Google advertisers are seeing settlement checks in the mail from a $20 million 2009 settlement for exceeding daily budgets in Hansen vs. Google Adwords. Only catch: some checks are worth less than the postage used to mail them. Google +1 Recommendations has launched. When a user hovers over a +1 button on your site, they will see other content recommendations on the domain or subdomain. Both Google and Bing recorded all-time highs in search market share for June, according to comScore. Google made up 66.8 percent and Bing held 15.6 percent of searches, with Yahoo down to an all-time low of 14 percent. Following a number of states passing legislation requiring online retailers to collect sales tax, Amazon is expected to shift to a strategy that features same-day shipping. Much speculation has ensued about how such a move could mean trouble for local retail. LinkedIn redesigned its home page with an enhanced visual update stream in a more scanable layout. Tabbed Sitelinks in Google SERPs was spotted by one blogger. The new layout could mean better-targeted traffic from the drilled-down direct links. Microsoft introduced Office 365, the newest iteration of the company's productivity software. The new version is designed with touch interface capabilities for tablet devices, has Skype integration and can run as a cloud-based service. Yahoo has reached a deal with Facebook to drop a patent infringement lawsuit in exchange for expanding the ad and content deal between the companies. 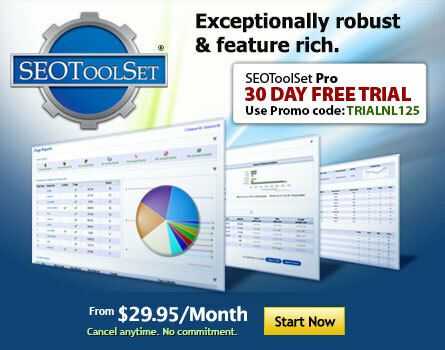 Each month, our developers make improvements to SEOToolSet V5 to ensure users have a more efficient experience. The following updates were made this month. Fixed certain tools that tried to display data when there wasn't any data, causing an error to occur. Applied a security fix to Read-only accounts. Added distributed database reads which results in a speed increase on some of the tools. Fixed a bug in our Sign Up form when certain messages from our payment processor weren't displayed correctly. Migrated to new cloud-based servers for increased performance.